SOLIDWORKS® software is a mechanical design automation application that takes advantage of Micosoft® Windows® graphical user interface.This softwares make it possible for designers to quickly sketch out ideas,experiment with features and dimensions,and produce models and detailed drawings.SOLIDWORKS® currently markets several versions of the SOLIDWORKS® CAD software in addition to eDrawings, a collaboration tool, and DraftSight, a 2D CAD product.The parametric nature of SOLIDWORKS® means that the dimensions and relations drive the geometry, not the other way around. The dimensions in the sketch can be controlled independently, or by relationships to other parameters inside or outside of the sketch. Introducing SOLIDWORKS® discusses some basic concepts and terminology used throughout the SOLIDWORKS® application.It familiarizes you with the commonly used functions of SOLIDWORKS®.SOLIDWORKS® is a solid modeler, and utilizes a parametric feature-based approach to create models and assemblies. The software is written on Parasolid-kernel.Building a model in SOLIDWORKS® usually starts with a 2D sketch (although 3D sketches are available for power users). The sketch consists of geometry such as points, lines, arcs, conics (except the hyperbola), and splines. Dimensions are added to the sketch to define the size and location of the geometry. Relations are used to define attributes such as tangency, parallelism, perpendicularity, and concentricity. Advance your idea from concept to market with increased modelling flexibility.In an assembly, the analog to sketch relations are mates. Just as sketch relations define conditions such as tangency, parallelism, and concentricity with respect to sketch geometry, assembly mates define equivalent relations with respect to the individual parts or components, allowing the easy construction of assemblies. 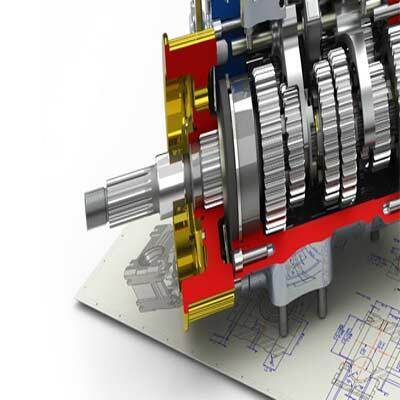 SOLIDWORKS® also includes additional advanced mating features such as gear and cam follower mates, which allow modeled gear assemblies to accurately reproduce the rotational movement of an actual gear train.Finally, drawings can be created either from parts or assemblies. Views are automatically generated from the solid model, and notes, dimensions and tolerances can then be easily added to the drawing as needed. The drawing module includes most paper sizes and standards (ANSI, ISO, DIN, GOST, JIS, BSI and SAC). SOLIDWORKS® Premium allows you to design products for a board range of inidustries and applicattions.SOLIDWORKS® Product Data Management (PDM) products manage and synchronize your design data across your entire enterprise with a single, easily deployable solution tightly integrated with all SOLIDWORKS applications. By leveraging a secure vault, you can extend the access to your 3D design environment and associated files, involved in your projects to share information and collaborate on designs, while automatically protecting your intellectual property with the automated version and revision control systems. Electrical cable/harness and conduit design. 3D modeling is being preferred not only by customers, but also by engineers and designers because they offer many advantages over the traditional 2D design. So, you need to learn 3D CAD, and SOLIDWORKS® is one of the widely used 3D CAD tools in the industry. SOLIDWORKS® can help you convert your ideas into product designs quickly, and effectively. Even without having any prior experience in animation, you as an engineer or designer can produce an animated movie of your 3D product design almost instantly. This will help you communicate your product ideas better to a non-technical person. SOLIDWORKS® comes with libraries of over one million pre-built or pre-designed components, so you don’t have to re-design industry standard components – like screws, nuts, bearings, etc. SOLIDWORKS® is focusing on growing a community of designers/engineers who are actively publishing their drawings online. There are millions of 3D drawings available for you to use or get inspirations.